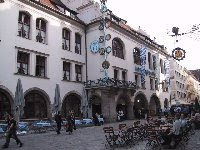 This year in Munich they are celebrating the 200th anniversary of Oktoberfest which runs this year from September 18th to October 4. The original Oktoberfest took place on on 12th October 1810, to celebrate the marriage of Crown Prince Ludwig, later to become King Ludwig I, and Princess Therese of Saxony-Hildburghausen. So with this in mind, I was excited to find Hofbrau Oktoberfestbier sitting on the shelf of my local LCBO. HofBräuhaus has been brewing beer since 1589 and the HofBräuhaus was built in 1897, a place that is definitely on my list of places to visit. 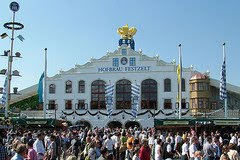 At Oktoberfest, Hofbrau boosts that they have the largest beer tent and serve over 550,000 liters of HB-Beer over the 16 day period. The beer pours golden in color with a good head, which leaves excellent lacings as it dissipates. There is a pronounced floral note from the hops in the aroma. This is a fabulous tasting beer. A hop presence throughout but not overpowering. Very clean taste. This is a quaffable beer which at 6.3% APV could present a problem. Still, it is worth having more than one of this excellent beer.